My current client has an internal mailing list that is a more-or-less “free-for-all” somewhat like Craigslist. It is used for non-business discussions such as things for sale (or wanted) or recommendations for/against local merchants. With NSFW topics, religion, and politics off-limits, of course. 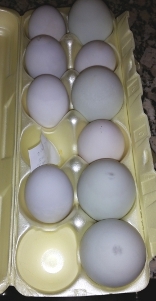 Last week, one of the employees posted that he had free-range duck eggs for sale. One of the things he mentioned about them was that the ducks had access to acorns in his yard, and as a result, the yolks were decidedly green. I decided I had to give this a try, so I got a dozen. First thing I noticed was there was quite a variation in size, with most being a bit smaller than I expected from duck eggs. The second thing I noticed was the color of the shells, which varied from a bluish tint to a definite greenish tint. On the way home from work, I stopped at the grocery store to get some… well, you probably already guessed it… ham, of course. For supper this evening, I fried a couple of the smaller ones in salted Kerrygold butter, and cut a couple of slices of ham. 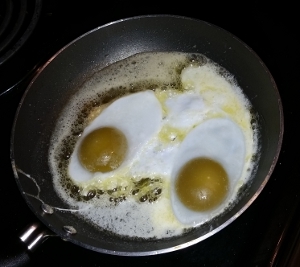 In the pan, the yolks were very high and round, and definitely greenish. After cooking, the green wasn’t quite so pronounced. As for taste, they weren’t all that spectacular. They tasted a lot like… eggs. 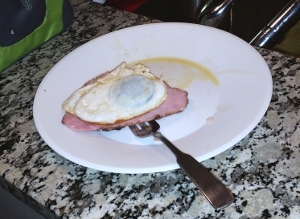 This entry was posted in Diet, Low Carb Fun. Bookmark the permalink.